The Millennium Development Goals are a story of success. By aligning political energy and resources, they have facilitated huge strides in tackling some of the world’s greatest challenges. In the last ten years we’ve witnessed dramatic reductions in poverty and mortality, and huge improvements in school enrolment. The MDGs have demonstrated that, when the international community works together, there is little we cannot achieve. But the MDGs have also served to highlight some of the world’s most persistent challenges, most notably the scourge of inequality. When national averages on poverty reduction, hunger, child mortality or education are disaggregated between the rich and poor, urban and rural areas, ethnic groups, or by gender or disability, we can see that some individuals and some groups are lagging a long way behind. Inequality is deeply rooted in countries’ history, politics and governance. It can manifest itself in lack of access to services, resources, power, voice and agency. And it can have costly and disastrous consequences. In Born Equal Save the Children powerfully demonstrates the cost of inequality to children. The report reveals the growing gaps between the richest and the poorest children, and the costs that this has on children’s health and development. 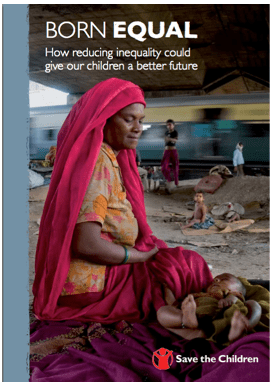 In this report, Save the Children argues that addressing inequality will be crucial to accelerate progress towards achieving the MDGs and to deliver the promise to eradicate extreme global poverty. But when seen through a child’s lens, we can see that reducing inequality is an important objective in its own right that should be reflected as a goal in any post 2015 framework. Inequalities that affect the household where a child is growing up may result in inequality of opportunity for that child. Because of their particular life-stage, inequalities experienced during childhood may have physical, psychological and opportunity effects throughout the rest of their lives. This report reinforces the imperative to act and demonstrates that the time is now if we want to prevent future generations from paying the price of inequality. A focus on alleviating absolute poverty must be augmented by a common commitment to tackle inequalities in opportunities and outcomes. The post-2015 discussions present an opportunity to showcase successful approaches for tackling inequality, while a global target on reductions in inequality would help to galvanise progress. Not only will this safeguard and build upon the progress of recent decades, but it can help to kick-start and sustain economic growth, since inequality and a healthy and inclusive economy are closely related.